So, you want to start a handbell choir. The only problem is, you don't know the first thing about ringing and your ringers are mostly newbies without a whole lot of previous musical experience. The good news is you don't need to have a lot of experience or professional training to lead and direct a handbell choir (though, that never hurts). 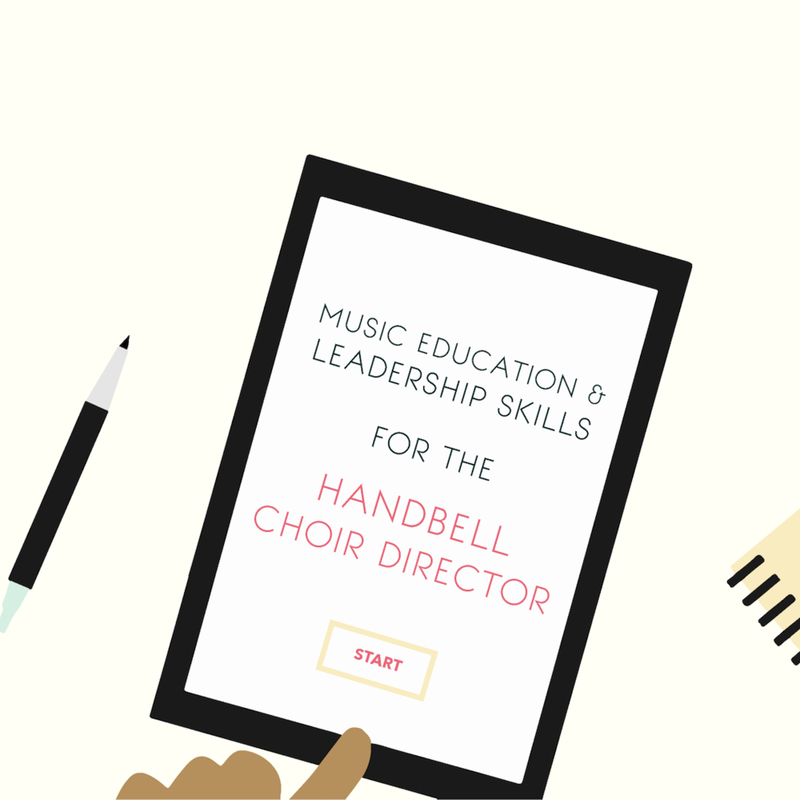 With a desire to learn, a solid sense of rhythm and steady beat, and a little practical know-how, you'll be on your way to building and leading a handbell choir in no time. Today, I'm going to walk you through the step-by-step process of starting and directing a handbell choir with little (or zero) experience. Let's begin by talking about the necessary equipment and supplies. Handbell choirs require a few special things that you don't see with other ensembles. Once you have all the necessary equipment and supplies, it's time to begin recruiting. Who will play in your group? Adults, youth, older children, mixed ages? If you're interested in creating an intergenerational group, I'd recommend inviting 3rd graders and up. One rehearsal a week should be fine - that’s how most churches do it. An hour would be great, if you could swing it, but 45 minutes works just fine. Begin by setting up the bells on the padded table in keyboard order, lowest to highest, and like a piano, with white keys toward the front edge of the table and black keys further back. Note: Handbells sound one octave higher than written. Therefore, C5 is Middle C (unlike the piano, where Middle C is C4). Assign each person two white-key bells, to start. For beginning music, you probably won’t really use the black-key bells (especially if you’re playing in C major) and if you do, it will probably be only 1-2 black-key bells (and they would be in place of the white-key bells). Demonstrate holding the bell, ringing in a circular motion, and damping on the shoulder. Give your ringers a few seconds to try this. *This is the basic sequence I tend to start with for new ringers to get them used the feeling of ringing and damping. Once you’ve gone over the basics of holding the bell, ringing, and damping, you might try a brief improvisation or rhythm activity. This is a great way to get everyone ringing and doing something musical right away, even if they don’t read music. Here are a few ideas. Does everyone in your group read music? If so, then you can jump right into playing from notation. If not, I’d recommend doing some things by rote in the beginning (use rhythm cards and bell letter names to help people keep track of their part). Much of what’s involved in teaching handbells comes back to rhythm, so do whatever you can to help your players develop rhythmic reading skills and a strong, internal sense of steady beat. This will set you (and your ringers!) up for success down the road. Consider starting with song charts made with a Post-It Note flip chart or poster board (or make individual copies for everyone to have in a notebook in front of them). Write out just the rhythmic notation with letter names underneath (no staff lines). If possible, indicate the direction of the melodic line on the chart, instead of writing it out in straight rows. Note: When you’re just starting out, you might try using a color-coding system to help new ringers learn to read and follow along in the music (this is especially helpful with younger ringers). You could even try color-coding the bells themselves in the beginning by placing small sticker dots on the handles (C = red, D = orange, E = yellow, etc.). Also, here’s a free acclamation my husband, Steve wrote for our bell choir a few years ago. We’ve used it during Advent and on Easter Sunday, though it could really be used any time. Download it and make as many copies as you need for your group! Once your ringers get the hang of reading rhythmic notation and playing their own part, introduce them to staff notation and point out which line and space match the bells they’re holding. Encourage your ringers to use highlighters to color-code their music before they play (e.g. blue = left hand bell, red = right hand bell). Here’s a fun (online) note-naming game you can play as a group to continue developing their reading skills. An invaluable resource for new ringers (and directors! ), this curriculum includes rote exercises, hymn and classical transcriptions, and lessons in essential playing technique. If you’re looking at a piece of handbell music, you might notice there are lots of different signs and symbols we don’t see in other types of music. Welcome to the world of handbell notation. Here’s a handy guide to handbell notation and what each sign/symbol means. And in case you're wondering what these techniques look/sound like, here are a few helpful video demonstrations so you know how to demonstrate them for your choir: Part I and Part II. Just so you know, some of these techniques are more advanced than others, and you may not see them in a piece of music until Level 3, or so. And there you have it! A step-by-step guide to starting a handbell choir. I hope this his helpful. Have questions? Ask away in the comments - I'd be happy to answer them! Feel like a newbie when it comes to leading and directing a handbell choir?